Volunteering is more than just sharing your time and talent, it's about the satisfaction of knowing you are helping people become stronger, giving back to your community and gaining valuable work experience that will enhance your career opportunities. YMCAs are deeply committed to providing opportunities for people to live healthy, confident, connected, and secure lives. 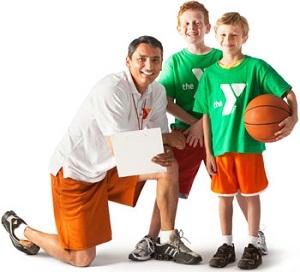 To engage and inspire our community, the James Family Prescott YMCA would like to connect you to your talent and passion. A volunteer is someone who performs a service willingly and without pay or compensation. If you have a few hours to spare and would like to help carry out the mission of the Y, please complete the Volunteer Application and return it to the Membership Desk. Contact Ryan Harlow, Membership Director with any questions at 928-445-7221 ext 213. To ensure the volunteer experience is a rewarding one for everyone, applicants will be contacted for a personal interview to discuss skills, experience, time commitment and any training required. Volunteers are at the heart of the Y. 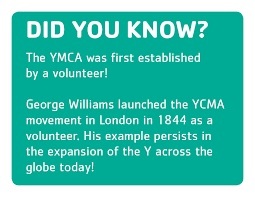 We were founded by a volunteer and we continue to be governed by volunteers. A great many of our programs for children and families are only possible because of the incredible people in our community who volunteer their time. Child Watch Attendant: The Prescott YMCA Child Watch offers drop-in child care for parents while they work out or take a class at our facility. We are in need of additional help in this growing and important area of our Y. Working with Y Staff, the Child Watch Volunteer would supervise and play with 1-9 year-old children during our morning session, 8am-12pm Monday-Friday. Download Job Description. Contact Ryan Harlow for more information. Member Engagement: Contact Ryan Harlow for more information. Dance - Advertising, Recitals, Instructors: Contact Samantha Beasley, Dance Coordinator for more information. Fundraising: Contact Damon Olsen, Executive Director for more information. Governance - Board of Directors: Contact Damon Olsen, Executive Director for more information. Here are a few of the many benefits you will receive as a volunteer. Fulfillment from making a difference in your community. Opportunity to learn new skills and work experience. Make new friends and acquaintances. Belonging to an organization with a history of giving back to its community. The mission of the James Family Prescott YMCA is to put Christian principles into practice through programs that build healthy spirit, mind and body for all. By upholding our core values of Caring, Honesty, Respect and Responsibility, the Y is committed to strengthening our community through programs that promote youth development, healthy living and social responsibility. The Y is dedicated to building healthy, confident, connected and secure children, adults, families and communities. Every day our impact is felt when an individual makes a healthy choice, when a mentor inspires a child and when a community comes together for the common good. When you volunteer at the Y, you take an active role in bringing about meaningful and enduring change right in your own neigborhood.